Begin by clicking the “Manage Participants” icon in the meeting menu . The participants window will open. To reveal the chat function in the participants window, select “chat” from the meeting menu . You can send messages to the whole group or privately to individual participants using the blue dropdown menu . Additionally, Zoom chats may be saved. Please visit Zoom’s “In-meeting Chat” documentation for more information on saving options. 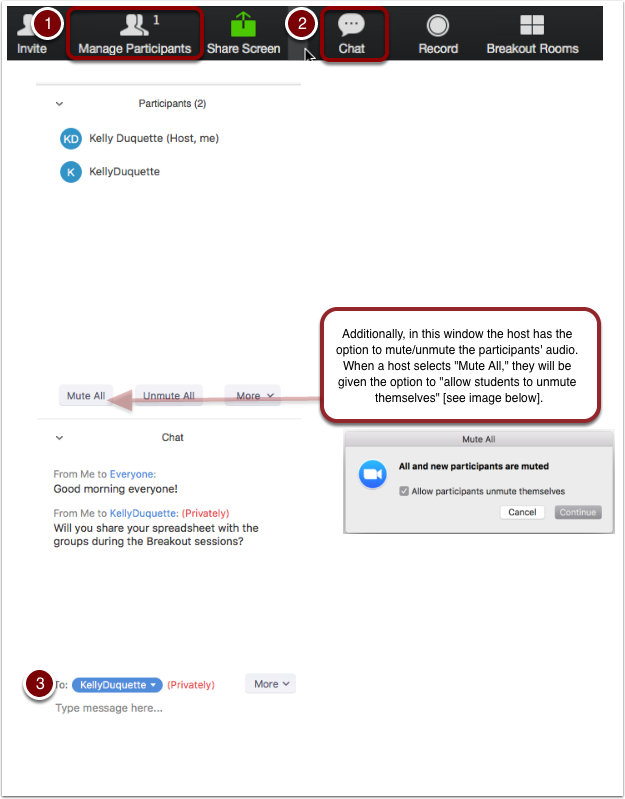 Students can message each other freely, and you can also message all students (‘Everyone’) or send a private message to an individual student directly. Students can use the ‘Raise Hand’ function to ask for permission to speak. To see this virtual hand raise, you must have the Chat function open. If you hover your cursor over the student’s hand, you will have the option to ‘Lower Hand’ once the student has been acknowledged. When one person is doing the majority of speaking, it is useful to use the mute all button. This stops sounds from the students/participants distracting from the main speaker. To Mute All, click ‘Manage Participants’ at the bottom of the screen. Click Mute All on the right. “Share Screen” lets you share your screen with meeting participants. Before clicking “Share Screen”, make sure the application you want to share is already open on your desktop. Simply click the ‘Share’ option at the bottom. When you click “Share Screen,” a new window displays all of your computer’s open applications. Select the window or application that you want to share. Then click “Share Screen” at the bottom right corner of the window. While you are in “screen sharing” mode, you will notice a green frame around the app you’ve selected to share. The green frame represents what your students will be able to view. Screen sharing options will appear in a menu bar at the top of your screen. The Whiteboard feature allows you to share a whiteboard that you can annotate with others. To go to Whiteboard, click ‘Share’ at the bottom of the screen. Click Whiteboard, then ‘Share’. To see all the options available for the Whiteboard, be sure to enter fullscreen mode. Only the instructor can erase or change content on the Whiteboard. You can save the Whiteboard images via the save button on the far right of your Whiteboard option bar. It will be stored in documents > zoom > meeting ID folder as whiteboard.png. Zoom sessions can be recorded. Only local recording (accessible on your device), not cloud recording (accessible from any internet-connected device), is available at this time. To record a meeting, click the “record” icon at the bottom of the meeting window. Zoom will record the meeting’s audio and video (if selected). Click “Pause/Stop Recording” to pause/end all audio and video recording of the meeting. The recording will not be saved until you end the meeting. 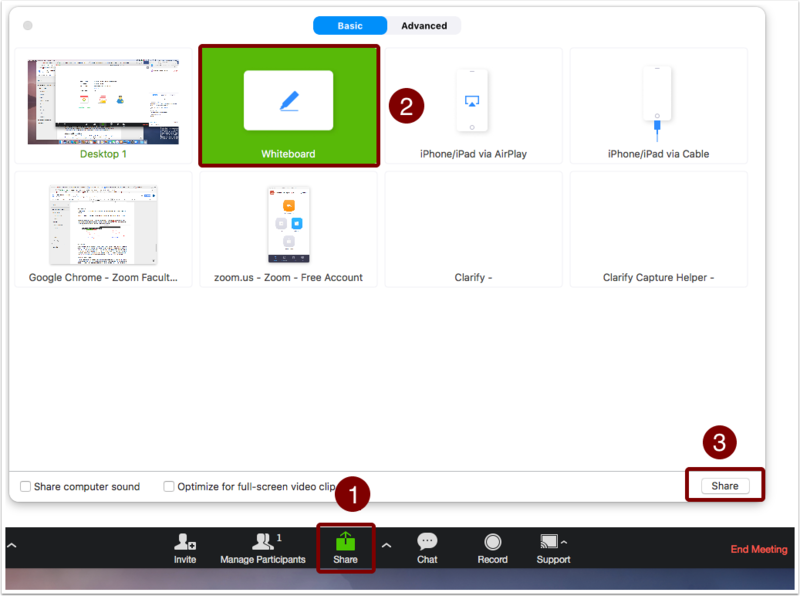 Once you end the meeting, Zoom will automatically create a folder for the meeting with audio and video files of the meeting. You can change the location and name of this folder in the window. 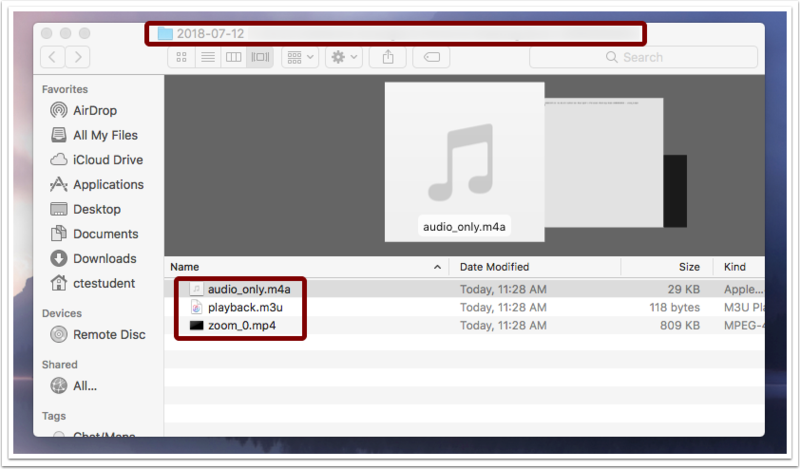 To upload this recording to your Canvas site the best way is to upload the video to Panopto first. Panopto is the video recording and playback software used at BC. We have detailed instructions for downloading Panopto from your Canvas course and for uploading videos to Panopto. From your Zoom home screen, select “meetings” . Then, select “recorded” at the top of the window . A list of recorded sessions displays. Roll your cursor over the title of a meeting to reveal more options . 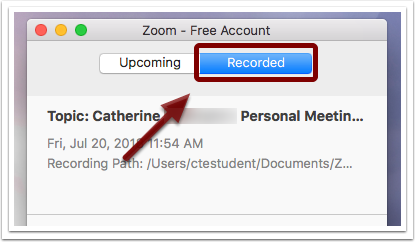 Here is a detail of the screenshot above highlighting the ‘Recorded’ button in the Zoom app which you click to access previous recordings. Video Breakout Rooms allow you to split your Zoom meeting up into separate sessions (50 maximum). The meeting host can choose to split the participants of the meeting into these separate sessions automatically or manually, and can switch between sessions at any time. 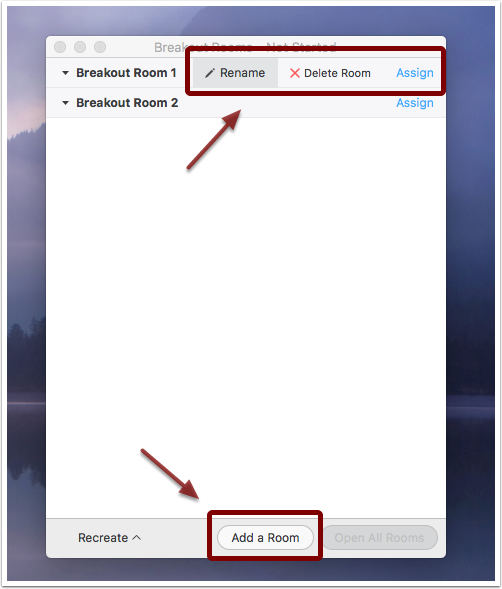 To put students into breakout rooms, simply click the Breakout Rooms icon at the bottom of your screen. You will then be prompted to assign students into rooms. You can choose the number of rooms you want to create. You can also choose whether to assign groups manually or to have Zoom assign groups automatically. After creating your breakout rooms, a small window will appear with a list of rooms. A blue ‘Assign’ link will also appear on the right. If you are assigning participants manually, you can click ‘Assign’ to group students. If you hover over a room, you will have the option to rename or delete rooms. Renaming the different rooms by topic or project can be useful in guiding students and keeping your class organized. You can also add a room if necessary. Once students have been assigned to breakout rooms, you can then open all rooms to have students join their rooms. 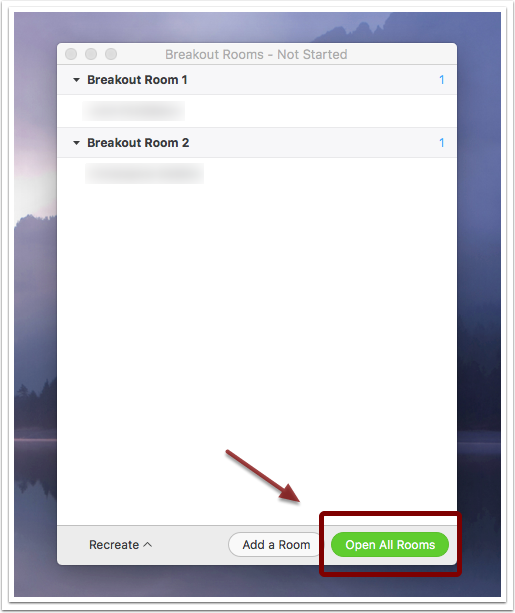 As an instructor, you can enter and exit breakout rooms as you wish, close rooms, or send a message to students in all breakout rooms by using the ‘Broadcast to All’ function. This allows you to send a message to all students without joining each room. 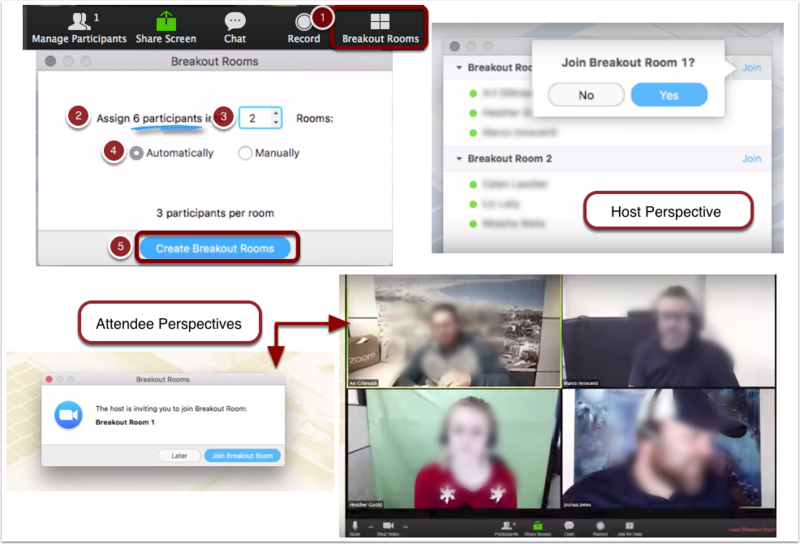 The graphic below shows breakout rooms from both a host and attendee perspective, as well as a quick review of the process for creating breakout rooms. 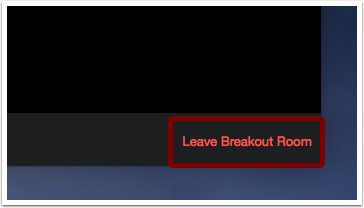 To leave a breakout room, simply click ‘Leave Breakout Room’ in the bottom right-hand corner. 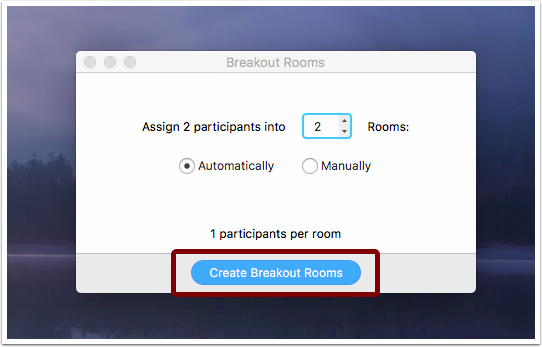 For an in-depth guide on Breakout Rooms, please visit Zoom’s “Managing Video Breakout Rooms” video tutorial. 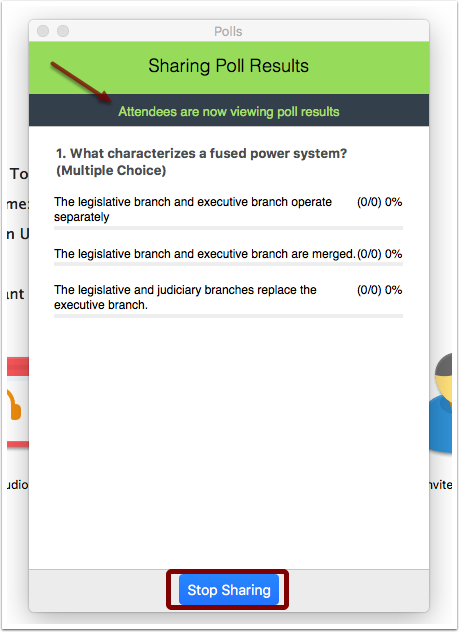 If set up before-hand, Zoom’s polling feature allows you to conduct brief whole-class polls that can be used for a variety of instructional purposes. 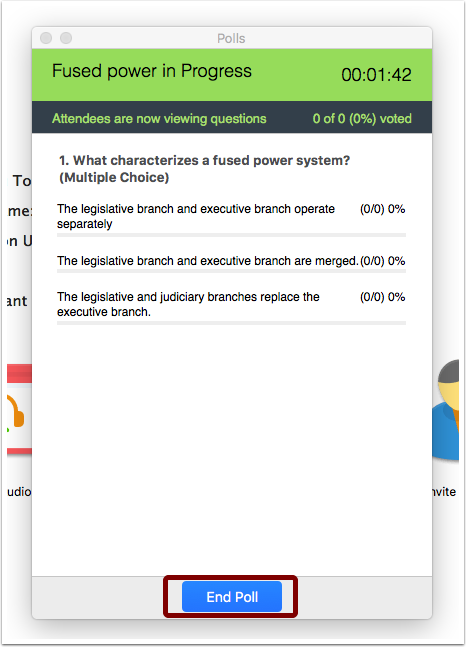 Polls in Zoom are a great way to quickly check whole-class understanding of a concept, conduct a quick review of a previous topic, monitor for misconceptions, or get a discussion started. Zoom polls offer only multiple choice style questions and display general participation data percentages. Because of these constraints, polling is not an effective way to run quizzes or gain data on individual student participation. Zoom polling, however, can give you important whole class participation data and allow students to visualize the concepts you are trying to teach in an engaging and interactive way. Polling does not appear automatically on your Zoom account; you will have to set it up prior to your session. To enable polling for your meeting you have to first set it up in your main Zoom account. To do this go to zoom.us and log in. Once you’ve logged in, click ‘Meeting Settings’ and then ‘In Meeting (Basic)’ and scroll down to “Polling”. Simply toggle “Polling” on, so that the control turns blue. You have now enabled polls for your meetings. When you schedule a meeting, you will be able to select your date and time preferences. Once you have scheduled the meeting, click on meetings on the sidebar and click the name of your meeting to open your meeting preferences. When you click “Add”, a pop-up window will appear to create a question. 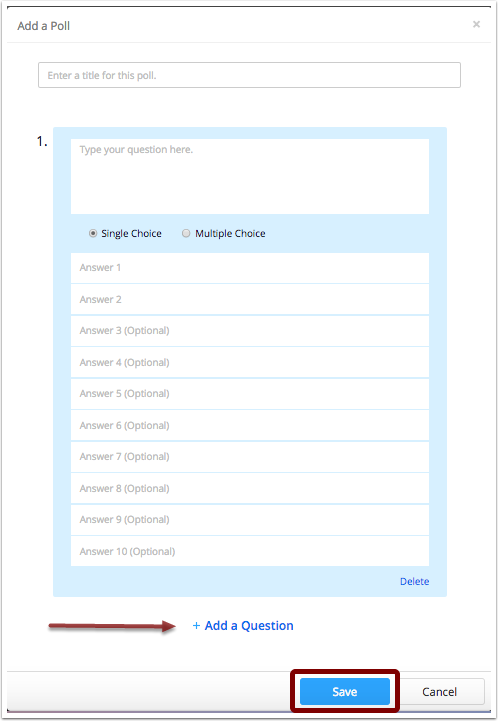 You can put in your question, select “Single Choice” or “Multiple Choice” and then put in your answer options. If you want to add multiple questions, click “Add Question” at the bottom of the pop-up window. Once you have finished creating all your questions, click “Save”. Once you’ve enabled polling, scheduled your meeting, and created your questions, you will be able to launch polling during your meeting. When you click polling, your question(s) will appear in a pop-up window. To broadcast your poll to session participants, simply click “Launch Poll” at the bottom of the window. Once you click “Launch Poll” a green timing bar appears at the top of the window. As participants respond you will see live updates of the percentage of the class that has taken the poll in the black bar at the top of the window. When ready to end the poll, click “End Poll” at the bottom of the meeting. To show participants the completed poll, click “Share Results”. You can also re-launch the poll if you need more participants to respond or had needed to pause the poll. Once you click “Share Poll”, the pop-up window displays the question and answers and the percentage of responses per answer. Displaying polling results can be a great way to visually present the variety of opinions or conclusions among students and can be a great discussion starter or opportunity to check for understanding and debunk misconceptions. When ready to stop sharing, simply click “Stop Sharing” at the bottom of the pop-up window. The pop-up window will disappear, but you can always view past poll by going to your profile on zoom.us and viewing your past meetings. If you click on a past meeting, any polls created for that meeting will show along with their results. More documentation on polling can be found at Zoom Support.